The famous Ring of Kerry route attracts visitors from all over the world every year. If you travel the Ring in the traditional anti-clockwise direction, the final stretch from Moll’s Gap to Killarney is one of the highlights of the route. 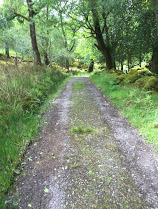 It is here that you will find a beautiful area of Killarney National Park known as Derrycunnihy. A small church by the roadside marks the spot from where you can explore the area. Whether it’s a short stroll to stretch the legs, or a jog through some rolling trails or as part of a longer trek through the lakeland paths, there’s something for everyone to enjoy here. Situated approximately 12km south of Killarney town on the main N71 Kenmare Road, Derrycunnihy Church is located near a bridge that crosses Galway’s river. 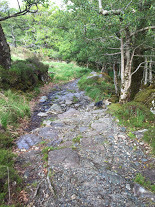 The trail forms part of the Kerry Way long distance walking route. As is often the case, there are a number of ways to access the trail, but if you’re in a car, there are two places nearby where you can park. The first option is at the car park near the church. An alternative starting / parking point is at a small lay-by on the main N71 about 1km from the church on the Killarney side (see map). If you are parking here, please be careful not to block access. You can easily reach the cascade from either of these starting points. The table below gives an indication of the distances from each to help you plan out the trip. From the church car park, head across the road and look out for the “Kerry Way” sign. 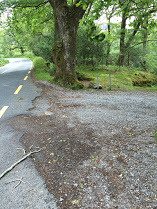 Keep an eye (and ear) out for cyclists that may be whizzing past on their way down from Moll’s Gap. Start to head down the trail via a little boardwalk. If you are going for a run, be careful on the uneven ground here, especially after a drop of rain. If you are with very small children, this way might be a bit challenging for the little people. The path meanders its way down along, crisscrossing some streams and eventually finding its way to some abandoned ruins amidst the woodland. At this point you will join a more substantial gravel based path which is the main trail to Lord Brandon’s Cottage (or the Mass Path as it is also known). Taking a left from here, it’s approximately 3 km to the Cottage. During the winter months, that last section of the trail can be flooded if the lake water is high. 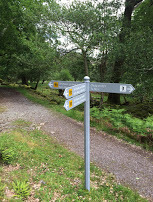 To reach the falls from this junction, turn right and let your ears guide you. 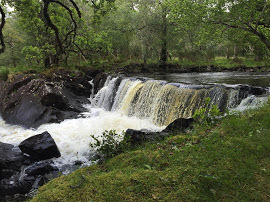 Although these falls are not to the same scale as Torc Waterfall or even the nearby Tower Wood falls, Derrycunnihy has a charm of its own. If you want to veer off the beaten track a bit and get a closer look at the bigger cascade, cross over the bridge and take a right and follow the rough path for a few hundred metres. This riverside route will reward you with an up close and personal view of the main cascade which is quite spectacular after some heavy rain. Keep an eye out for red deer in the vicinity as they often frequent here. Other less shy residents include the midges that will greet you in the summer months. 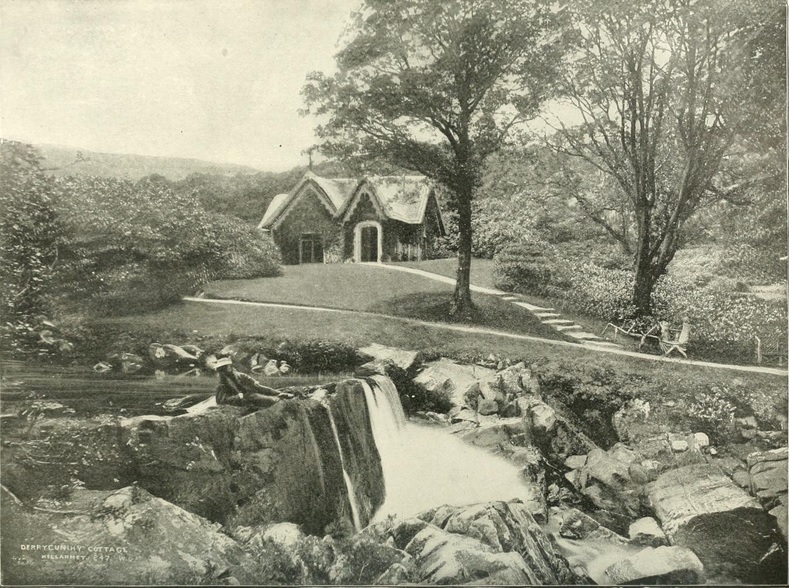 Another one of the hunting lodges built for the visit of Queen Victoria to Killarney in 1861, the “Queen’s Cottage” was situated right next to the smaller falls. Today, no trace of the ruins remain. The banks of the river here provide ample spots for a summer picnic or to just enjoy the cascade and the adjoining pools. The path continues on from here to the lay-by that serves as an alternative starting point for the trail. If you are heading back to the church, you need to retrace your steps back along the path and up the trail to your starting point. Although it’s not as easy to find and can be a challenge to park at, the alternative starting point has its attractions nonetheless. It’s a more forgiving surface underfoot (or wheel) and is generally much flatter than the approach from the Church. The trail leads all the way to Lord Brandon’s Cottage and the Gap of Dunloe. However, it’s a much more leisurely spin down to the cascade that lies beneath you in the woodlands. For the cyclists amongst you it is possible to cycle this route from here although it can be a little bit rough underneath in parts. So if you are worried about your shiny new bike it might not be the best place to go for a spin. A mountain bike would be better suited to some parts of the trail but it can be negotiated on a road or racer bike. Don’t just take my word for it, though, in fact the path was part of the route for one of the stages of the Killarney St. Patrick’s Day Adventure Race. Generally the path is flat and easy to navigate although there is one stream crossing that requires a bit of rock-hopping during the winter to negotiate your way to the other side. It’s one small step for a (wo)man but can be a giant leap for any aqua phobic dogs or children in your group. As you approach the cascade, the path opens up and a wooden footbridge heralds your arrival to the cascade. Even if you are not walking the whole way to Lord Brandon’s Cottage, it is worth following this path for at least another kilometre or so beyond the cascade. You will be rewarded with some more beautiful lake views as you traverse along the Upper Lake. Rising above the lake, the McGillycuddy Reeks offer a spectacular backdrop. If you do decide to head on to Lord Brandon’s, you can look forward to a nice break on the shores of the Upper Lake. It is also one of the best places to catch a glimpse of the White Tailed Sea Eagles that now live again in Killarney National Park. During the summer months, there is coffee shop serving refreshments. For the well organised and adventurous you can even return to Killarney via boat from here. And for the really adventurous, you can continue on through the Black Valley and the Gap of Dunloe – but that’s a tale for another day….